Kundapur, oct 26, 2017 : The monthly collection from the hundi at Sri Mookambika Temple at Kollur in Udupi district hit an all-time high with the money received standing at Rs 1,10,66,278 on Tuesday. G.C. Janardhan, Executive Officer of the Sri Mookambika Temple, told The Hindu on Wednesday that the money collected in the hundi is calculated once in a month. Accordingly, the money from the hundi was calculated on Tuesday and it stood at Rs 1.10 crore. In addition to this, devotees had donated 870 grams of gold and 3.2 kg of silver. “The amount of Rs 1.10 crore is the highest monthly collection from the hundi in the temple. The previous high was Rs 1.07 crore collected in May 2014,” he said. Mr. Janardhan said that the increase in hundi collection was because there were many festivals in the last month, including the Maha Navaratri and Deepavali. Besides, there were the winter vacations for the schools and government holidays. This had contributed to the increase in collection. The devotees had donated not just in Indian currency but also in currencies of several countries, including Sri Lanka, Malaysia, Australia and Kuwait. The foreign currencies, whose value is about Rs 1 lakh, had been deposited in the foreign exchange account of the temple at the Syndicate Bank in Kollur, he said. The last monthly calculation of the money received in the hundi was done on September 21, 2017. Normally, the donation made to the hundi of the temple, on an average ranges from Rs 60 lakh to Rs 70 lakh per month, he said. Sharing another detail, Mr. Janardhan said that the amount of money collected at the Seva Counter, Special Darshan and Prasada Counter in the temple on September 29 and 30 and October 1 and 2, was Rs 90 lakh. This too was due to the festive season, he said. 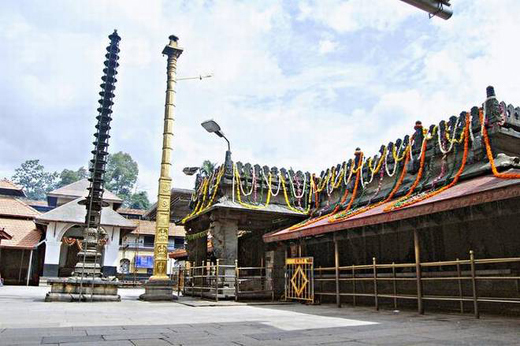 The Mookambika Temple, established by the exponent of Advaita philosophy, Sri Adi Sankaracharya, attracts devotees not only from the State but also others and foreign countries.